I’M HOSTING A CHARITY CLOTHES SALE IN MANCHESTER! Hey Hey Hey, I really hope you've had the BEST most beautiful of weekends in the sunshine with your loved ones. Mine has been absolutely spot on and involved some planning for my very exciting charity clothes sale that I'll be holding next week on Sunday 25th June in Manchester... EEEEK! 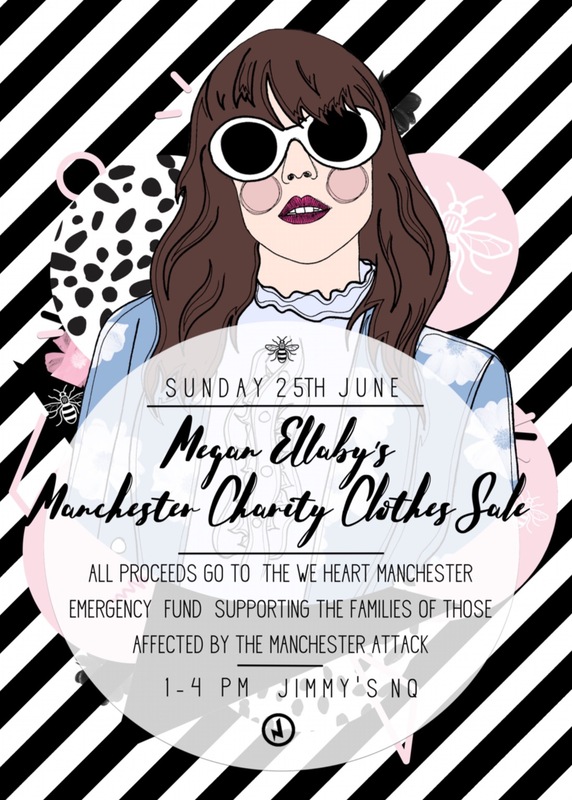 The sale will be held at Jimmy's NQ, 12 Newton Street in the Northern Quarter, and will include TONNES of clothes, shoes, accessories and some beauty from my own wardrobe and beauty stash to raise as much money as possible for a very special cause that is extremely close to my heart. The We Love Manchester Fund was set up after the Manchester attacks and supports the families and victims affected by the May 22nd Bombings. With that, 100% of all the proceeds made from the clothes sale will go to the charity. I've wanted to host a charity sale for some time, so when this awful attack happened in my hometown I knew that now was the time. I am honestly SO excited about this, I think it's going to be a really fun afternoon, from 1pm-4pm and I would absolutely LOVE to see you all there. There will be tonnes of clothes (ofc) along with great tunes, an Ella-Bee cocktail, a raffle and tonnes of mega babes I am sure. I really hope you can make it down, to say hey and to raise as much money as possible for such a special cause... And hopefully you'll be taking away some bargains with you too. Stay tuned over on YouTube and Insta Stories this week to have a sneak peek of some of the things I'll be selling at the sale, let's just say, there are some SERIOUS bargains to be had. Please let me know if you can make it, I can't wait to meet you all!